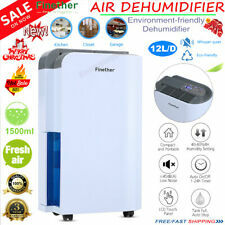 This Air Dehumidifier is modern, portable and very economical to use. It's collection system has a 500ml capacity water storage tray which is easy to remove and empty. The unit will automatically shut off once the tank is full. Suitable for room size 15m². Size H22, W15.4, D13cm. Dehumidify max capacity: 12L / D(30℃, 80%RH). The auto humidistat allows you set the desired humidity level between 40-80%RH and ensures the unit always operates at its maximum efficiency with low power consumption. Pro Breeze 1500ml Mini Dehumidifier. Large 1500ml capacity water tank. When the 1500ml water tank has reached maximum capacity, a convenient indicator light lets you know it is full - the mini dehumidifier will then automatically switch off until the tank has been emptied. Perfect for Indoors & Outdoors. LAUNDRY DEHUMIDIFIER. The CD12P features a clever light indicator to show the current level of humidity in your room. As the humidity level reduces, the light on front of the unit changes colour from Red to Orange to Green. 23W Low energy dehumidifier with humidity sensor. 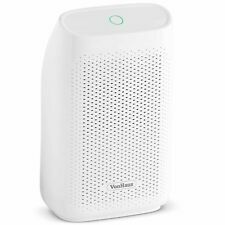 【Whisper Quiet 】The silent bedroom dehumidifier is designed with peltier technology with no compressor, 35db lower noise, with no annoying sound. It runs quietly without interfering with your sleep, work or study. 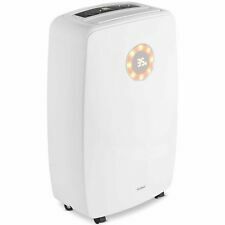 Pro Breeze 500ml Mini Dehumidifier. When the water tank is full, simply remove it from the dehumidifier, pull the plug out and empty it into a sink or drain via the easy-to-use water outlet. Then, simply place it back into the dehumidifier and switch it on again. Chase mould and damp away with this compact, light and portable unit. Water tank capacity of 1.5 litre (approx.). "black" or white. Auto switch-off when tank is full. WDH-316DB 16LTR DEHUMIDIFIER (1379G ). Product Type Dehumidifier. 2.4Ltr Tank. Tank Capacity 2.4 Ltr. then turn on and press the dehumidify button until the display goes from 70% down to continuous. Switch Type Electronic Switch. Ideal for bathrooms, small rooms, cupboards, caravans, sheds etc. They effectively reduce bad odours. For large rooms up to 20m²: perfect for dehumidifying the bathroom, kitchen, bedroom, caravan or wardrobe for up to 3 months per tab. condensation, allergens in the air and mould. Features: 100% brand new and high quality! This dehumidifier is lightweight and quiet. It is perfect for small rooms and poorly ventilated areas. Using this dehumidifier will help eliminate unwanted moisture from the air. Suitable for home, office and many more locations. Specifications:. The auto humidistat allows you set the desired humidity level between 40-80%RH and ensures the unit always operates at its maximum efficiency with low power consumption. Equipped with an 1.5L removable water tank and a continuous drainage outlet, it is convenient to empty the water from the tank or directly connected a hose into the drainage outlet.The unit will auto stop and water full indicator light will show red once the tank is full, no need to worry about water leakage. If you have excess moisture in your home that's causing mould on the walls or condensation on your windows, a dehumidifier could help to reduce the humidity and visible signs of damp. In addition to being unpleasant to look at, damp can also adversely affect your health. To help you remove the excess moisture in your home, you'll find thousands of dehumidifiers from popular brands including DeLonghi, Prem I Air and Ebac, all suited to different homes and personal needs. There are two main types of dehumidifier available: refrigerant and desiccant. Refrigerant dehumidifiers are a popular choice for households in the UK and are also known as compressor dehumidifiers. They use cold metal coils to condense the hot and humid air that enters the filter, collecting the water that condenses before recirculating drier air into the room. Desiccant dehumidifiers, including the EcoAir DD122 MK5 model, use an adsorbent material to extract water from the air before heating it and collecting the resulting water. This type of dehumidifier is recommended for rooms with lower temperatures, such as conservatories and garages, where damp may occur more frequently. Whichever type you choose, you'll find a range of styles available including portable and desk sized dehumidifiers through to upright standing units, including the Excelvan 1.5L unit. You can also find dehumidifiers that use fragrances such as jasmine, lavender, rose and orange, perfect for combatting unpleasant smells caused by damp and mould. Choose from handheld, wireless and wired versions with power output ranging from 1,000 watts to in excess of 10,000 watts. You can also find dehumidifiers and moisture traps that can be used in small spaces, such as cars or cupboards, where an electric unit may not be suitable. Dry Pot room dehumidifiers are discrete pots, perfect for smaller spaces.